Pebble has posted a note on its Kickstarter page to confirm that, as promised, shipments of the E-Paper watch have begun to first backers. While the Android Google Play application is scheduled to go live tomorrow (January 24th), Pebble says that it has been actively working with the Apple App Store review team on getting the iOS version of the Pebble app approved. Pebble says it submitted the application two weeks ago but it is yet to be approved. Pebble says that, it unfortunately, was not able to get out as many Pebble units today as planned. 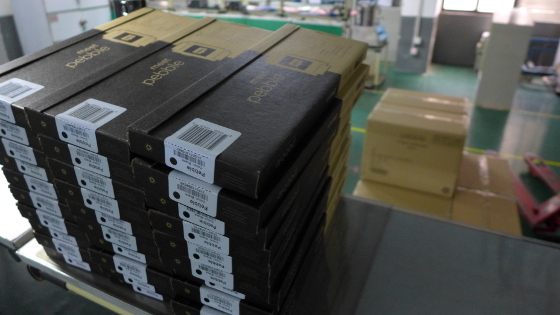 The company is shipping out 500 watches today, with more shipping out soon. The company warns that shipment confirmation emails may have gone out to backers whose watches actually did not ship out today. The company has put together a website for backers to check their shipment status. A website for those who ordered directly from the Pebble website (not Kickstarter) is in the works. Pebble says that its full mass production capacity per day is 2,400 units. However, the company is currently producing only 800-1000 watches each day. The first production and shipping run of Pebbles is for the most popular unit, the black colored watch, according to the company’s new Kickstarter posting. Producing multiple colors simultaneously was proven “impossible,” according to Pebble’s creators. They are hoping to begin making other colored units soon.